Just when you thought Eataly couldn't possibly generate any more excitement, there is yet another reason to stop by the corner of Fifth Avenue and Broadway- at 23rd St: Identità New York. 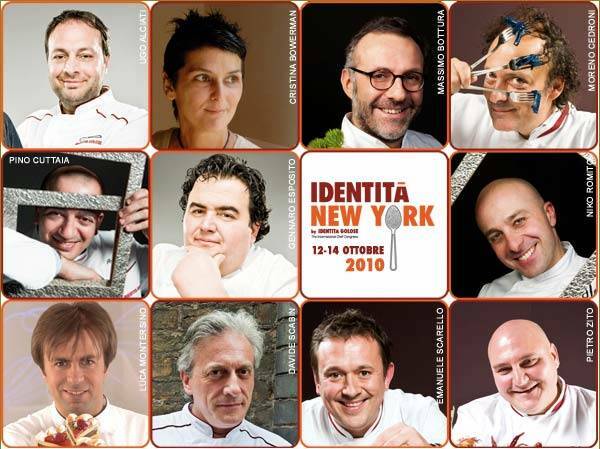 A series of cooking classes offered at Eataly from October 12th to 14th by 11 Italian Master Chefs. And each restaurant will offer 2 special dishes by two of these acclaimed Italian chefs in addition to the regular menu offerings. Nicola Farinetti, the youngest son of Eataly's founder Oscar Farinetti and store manager of the hottest food retailer in New York, explained the format to us after a long interview a few days ago and made us curious. Ugo Alciati, of the Michelin-starred Guido restaurant in Pollenzo (CN), is a living legend in Italian food. Son of Guido, he inherited from his father the philosophy of fusing quality, and simplicity. They are best known for the magic they work with veal and the restaurant is part of the Pollenzo campus of the University of Gastronomic Sciences. Cristina Bowerman is head Chef at the Michelin-starred Glass Osteria in Rome. With fourteen years in the restaurant business in Austin, Texas and a degree in Culinary Arts from the Cordon Bleu in Paris, Cristina prepares contemporary dishes with an emphasis on texture and locally grown ingredients. Her signature dishes are lobster and prosciutto; crispy sweetbreads with cauliflower and chocolate sauce; and a risotto with oysters, crème fraiche and artichokes. Massimo Bottura is Chef-owner of the Michelin-starred restaurant Osteria La Francescana in Modena, Emilia Romagna. Recognized for his skills in the kitchen and for his artistic presentation, Bottura’s cuisine is an avant-garde adaption of traditional cooking from Emilia Romagna, in which old and the new coexist to bring the eating experience to unprecedented places. His restaurant was named the best restaurant in Italy, and in 2009, it was finally included in the Top 50 Best Restaurants of the World. It is now ranked #6. Moreno Cedroni is the Michelin-starred Chef and co-owner, with his wife Mariella, of La Madonnina del Pescatore in Senigallia, on the Adriatic coast in the Marche region. He also owns Il Clandestino Susci Bar, on the beach close to Conero Hill in Portonovo, near Ancona. In 2003, he founded Officina, where Cedroni’s gastronomic specialties, fish above all, are preserved, made available to the public and, as he says on his web sites, “made immortal.” Amongst the top rated specialties squid with peas, octopus with potatoes and parsley, and roasted white tuna in extra virgin oil. Pino Cuttaia is Chef-owner of the Michelin-starred La Madia reastaurant in Licata in the province of Agrigento. Originally from Licata, Cuttaia lived in Turin for 8 years while working in a factory. Eventually he gave into his passion for cooking, promptly returning to his home-town to open the restaurant. In the North of Italy he learned precision, he confesses on his web site, but it was to the south and to the recipes of his childhood that his heart belonged. Having returned to his roots, he continues to draw inspiration from his days in the Piedmont, thereby uniting flavors from two different worlds in a variety of delicious ways. Gennaro Esposito is the Chef-owner of the Michelin-starred La Torre del Saracino in Marina d’Equa, just outside Vico Equense, on the Amalfi Coast. Esposito’s restaurant is known for his inventive adaptations of staple dishes. For example his Bolognese Ragout is made with octopus rather than the more traditional trio of beef, pork and veal. Espositos’ partner, Vittoria Aiello, pastry chef, caters to his customers' sweet tooth. Two paramount events are in the background of Esposito’s culinary life, an internship with Gianfranco Vissani, Italy’s top chef, and a coincidental encounter with Alain Ducasse. Niko Romito, Chef-owner of the Michelin-starred Ristorante Reale in Rivisondoli, in the province of Aquila, was studying Economics in Rome when his father decided to turn the family pastry store into a restaurant. Niko decided to change careers and become a chef. He moved to Venice to study at the Istituto Superiore Arti Culinarie Etoile. When he came back to Abruzzo, with the help of his sister, he revamped, and renamed the family restaurant. His forte: traditional regional ingredients mixed with modern techniques and minimalist presentation. Niko Romito was awarded the title of Italy's Best Chef at last year's Identità Golose. Luca Montersino is one of the most popular Italian pastry Chefs. He is also a food researcher, food writer and consultant for important pastry companies. From 2001 to 2004 he was director of the Istituto Superiore Arti Culinarie Etoile. He is also author of many cook books. Davide Scabin is Chef-owner of the Michelin-starred Combal.Zero. A13th century medieval castle in Turin forms the stage for his theatrically innovative creations. Scabin, one of the world's leading chefs for experimental cooking, is known for taking recipes and subvert them in unexpected and successful ways. Pasta sushi with amberjack and foie gras, spaghetti pizza margherita, with glazed- baked cherry tomatoes and a hint of burrata cheese, are some examples. Emanuele Scarello owns and cooks in what is considered to be the best restaurant in Udine and, according to L’Espresso, a major Italian newsmagazine, in Friuli Venezia Giulia at large. Michelin-starred Chef-owner of Agli Amici in the charming town of Godia (famous for its potatoes), Scarello is the fifth generation of his family to operate the restaurant. Scarello is known to push boundaries and experiment with new techniques while incorporating the local traditions. Pietro Zito is the Chef of Antichi Sapori, the Michelin-starred restaurant of Montegrosso (Andria) in the province of Bari. Son of two local farmers from the Murgia, Zito was an agricultural expert before pursuing a culinary career. He celebrates Puglia, the heel of Italy, and its products cime di rapa, pomodorini, extra virgin olive oil, grano arso, burrata from Andria and Pecorino canestrato. Zito's goal is to rediscover and incorporate products and flavors of the Murgia countryside and to make them known around the world.